Milan 2010: French designer Matali Crasset presented a lighting collection with branching forms in Milan last week. Called Foglie ('leaves'), the series includes a wall, pendant and floor lamp, and was created for Italian brand Pallucco. The natural elegance of the branches of a tree provides the inspiration for the new family of lights called Foglie (“leaves” in English). 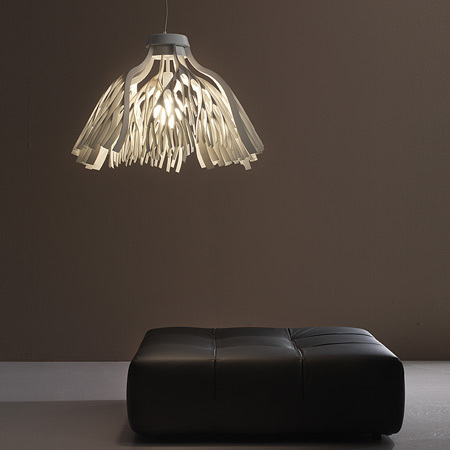 Available into three different versions: in the floor version, the stem of the light becomes the tree trunk and the branches are transformed into unusual minimal leaf-like appendages. In the wall light the branches are grafted onto the walls while the ceiling light has leaves hanging down, creating light and shade effects on the walls and surfaces below. The inspiration for the Foglie design is a fractal: a geometrical shape which is repeated throughout its structure in different sizes. It reflects the principle of nature which determines growth: from simplicity to complexity.